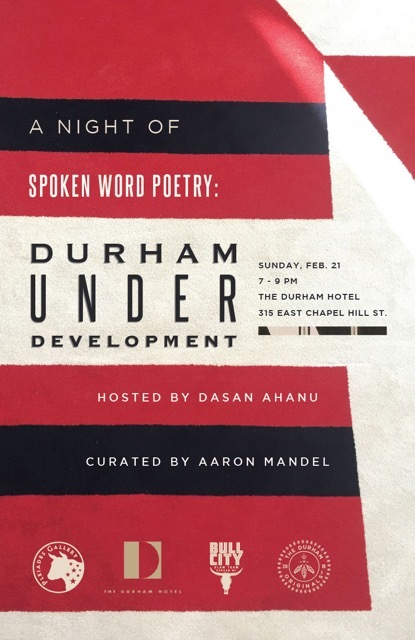 Poet and activist Dasan Ahanu, writer and social commentator Aaron Mandel and Pleiades Gallery are collaborating to present an evening of Spoken Word Poetry on the theme “Durham Under Development” on the roof. Dance and movement on the theme will be the original work of choreographer Stephanie Leathers performed by Emily Aiken. This event is a part of an exhibit on “Durham under Development” running February 11th through March 6th at Pleiades Gallery. This is a public event and the bar and kitchen on the roof will be open normal business hours 3-10pm. Ahanu is a world-class Spoken Word poet, an educator, a public speaker, a community organizer, and now a Harvard Fellow. Born and raised in the Triangle, Ahanu has a long history of speaking out on behalf of the community personally, as well as helping others make their voices heard.